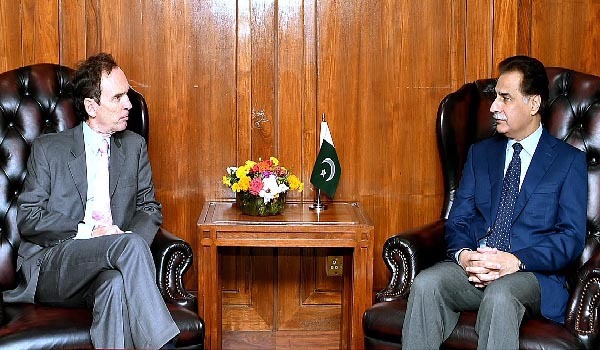 ISLAMABAD, Aug 11 (APP): Speaker National Assembly Sardar Ayaz Sadiq has said that Pakistan is determined to pursue broad-based bilateral cooperation with Argentine in expansion of economic relations. He said this while speaking to Mr. Ivan Ivanissevich, Ambassador of Argentine to Pakistan who called on him at Parliament House here Thursday, said a press release. The Speaker also handed over invitation to Ambassador for the Speaker of Argentines’ Parliament to visit Pakistan. The Speaker said that exchange of Parliamentary delegations and economic cooperation would give a renewed strength to the relations between both the countries Pakistan and Argentine. In addition to strengthening Parliamentary ties, he underlined the need for a comprehensive framework to cement people to people contacts. Talking about investment in Pakistan, Ayaz Sadiq said that the government had introduced a number of incentives for foreign investors besides providing conducive environment to them. He also highlighted that Pakistan’s political and military leaderships committed to root out terrorism in all its forms and manifestations from the society. The Argentine Ambassador Mr. Ivan Ivanissevich highly acknowledged Pakistan’s sacrifices and endeavors for global peace and security. Pakistan has played a frontline role against the scourge of global terrorism which was acknowledged by the entire world, the Ambassador remarked. Ghous Bux Khan Mahar, Convener of Pak- Argentine Friendship Group was also present on the occasion.